A great gift for anyone who loves construction toys. 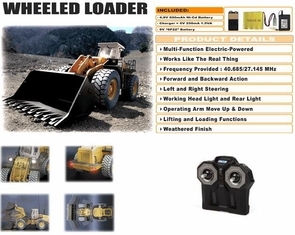 The premium heavy duty remote control (RC) front loader bulldozer construction truck has a detailed interior, working headlights/tail lights, and controls for digging and dumping dirt and other payload. It comes with everything you need, including a rechargeable battery pack, charger, and wireless transmitter. This heavy duty RC Dozer will keep you entertained for hours! Awesome detail including walk around safety rails and weathered finish. RC Excavators make a great gift for construction lovers of all ages. Order 2 vehicles and we will send 2 different frequencies so they will work together for double the fun. The benefit of paying the extra money and getting the premium version is that it comes with a 2.4g remote system so that you don't have worry about interference with the other construction toys you and your friends or family are using together. The premium version also has stronger motors, is slightly faster, and has an extra channel that independently moves the scoop on the end for true dumping motion. If you are a hobby enthusiast or a heavy equipment operator you will truly appreciate the detail and quality of this radio controlled front end wheeled loader. Check out the video below. Fully assembled and ready to dig. I have to say that having an interactive activity for the kids was the hit of the Greenfest! We had many, many positive comments and several parents asked where we got such fun trucks. When we referred them to your website they immediately looked it up on their smart phones. Kids were standing in line to try the trucks. Even the youngest kids, may 3 or 4 year olds were able to use the trucks with assistance from us or their parents. In those cases we had the kids just move the control forward or back and we or the parent steered. Then the kid could push the button to dump out the compost packet. That seemed to be the most exciting part! Then they could keep the packet as a souvenir. Who knew that packets of dirt would be so popular? We set up the course using traffic tape, traffic cones and sticks with caution tape. We had enough room to use two trucks and loaders at the same time. The controls were easy enough for all but the youngest children to get the hang of. Most kids are used to using joysticks but these are different in the sense that one joystick doesn't move the truck in all directions. One is forward and back, the other steers left and right. Once they got used to that they could drive them easily. All four of the RC vehicles got some abuse. They were all picked up several times by kids of all ages by all parts of the vehicles. They were very sturdy and nothing broke off, to our surprise! Even when several older kids decided to play demolition derby and repeatedly ram each other's trucks, no damage was done. As far as battery life, we had the trucks in use from 10 am to 4 pm, with more or less constant use. We did not change batteries in the controllers, even though they were the original batteries we put in when we got the vehicles several weeks ago. The controllers lasted all day! We only changed the batteries in the trucks once early in the day, then they lasted till we closed. We did make sure to turn off the trucks and controllers during slack times. lie: @MontCo_Highways has an awesome interactive activity at #GreenFest. So thank you for providing the vehicles that were not only fun but also very sturdy and long lasting. Please check out the attached pictures. My son really enjoys these trucks! Thank you. Want the best remote control excavator? Buy this one, you will be extremely happy.